This twist-lock 30-amp part is probably the most common type of single-phase three-pole outlets found in most portable generators over 4,000 watt. Theoretically, its maximum rating is 250Vx30A= 7,500 VA. In reality, the generator normally provides only 240V rather than 250, and in addition, UL and NEC® 2017 require ampacity derating to 80%. Therefore, practically you can safely get about 240x30x0.8= 5,760 VA continuously, assuming you managed to balance electrical loads on both 120V lines. 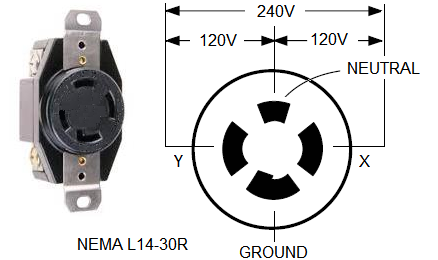 The mating plug part number is L14-30P. If you want to assemble a generator cord by yourself, to connect a cord to the plug, hook up red and black leads to X and Y, white lead to the neutral and green one to the ground (refer to the wiring diagram above). Use a heavy-duty UL-rated cable suitable for outdoor with conductor gauges of #10 AWG. Alternatively, you can buy a so-called generator Y-adapter that splits its 30A output into two regular 15/20A outlets. To temporarily power your entire house in case of an emergency, see this page for information on using dryer outlets.